When most college students roll out of bed, it’s not until later in the mornings or, if they’re lucky, the afternoon. Then, they grab a slice of leftover pizza or whatever’s handy, chow down, and run to class. However, if you’re an early riser near the University of Dayton in Dayton, Ohio, you have a breakfast option no one else in the United States has. 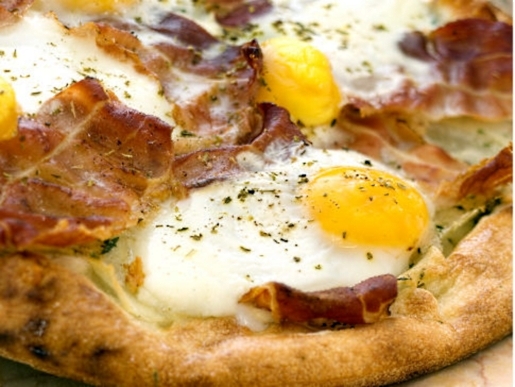 The local Domino’s franchise is the first in the United States to offer a trial run of breakfast pizza. “It’s like quiche on a pizza crust,” describes franchise owner Tristan Koehler, whose franchise is only one of four to take on the $7.99 breakfast pizza trial run. “I know it sounds weird to hear ‘breakfast’ and ‘pizza’ in the same sentence, but it’s actually a really good product.” I’ve also heard good things about Burger King’s pizza burger, though I’ve never tried it. The pizza base is cheese and bread, like most pizzas, but the Domino’s breakfast pizza also features eggs. Once you add toppings, like sausage, bacon, onions, and green peppers, the result is a hearty, carb-loaded breakfast fit for a king. The goal is to improve pizza purchases between 6 AM and 9 AM at the Dayton-area Domino’s Pizza, which is the only franchise in the United States open for 24 hours a day.